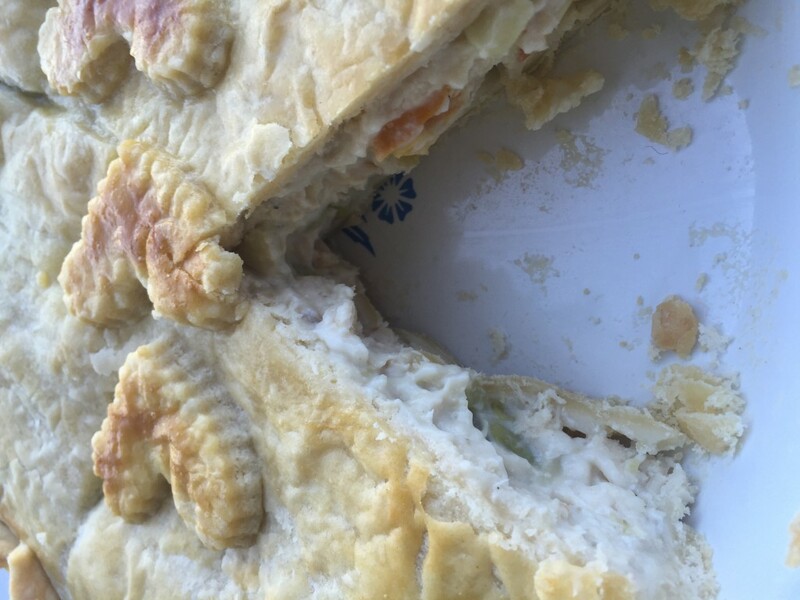 Leftover Turkey Pot Pie gives new LIFE to that turkey you’ve eaten so much of y’all!! As soon as you taste the first bite you feel cozy and crazy grateful and you immediately want more because it’s SO good you think you may miss out if you don’t inhale it! If this isn’t grace in food form then I don’t know what is. You get this creamy sauce that is full of tender veggies and shredded turkey. Then you get to enjoy all of that goodness tucked into a buttery crust x two. Gah. Lord, you love us enough for Double Crust Leftover Turkey Pot Pie at that! Quite possibly I think, two layers of buttery pie crust could unite the world’s problems if everyone just came together and shared it, right? Well, it at least will make any wonky day better; I promise! You guys, on the real, When it’s Leftover Turkey Pot Pie day in my house I am literally on cloud 9 leading up to the prep and baking! Literally joyful Y’all! There are a few meals that just make life better in my book or that are just so magical I can only eat them on occasion. This is one of them! Probably the most memorable one is this insanely good Filet & Scallop dish I get once a year in Kill Devin Hills, NC. Collington Cafe is worth the drive to the beautiful Outer Banks Y’all. Another dish I only get once a year (drum-roll) Mahi Mahi Tacos @ K38 in Wilmington NC. (Didn’t think I’d say that did you?) Ha. They’re just so good and Nobody locally makes anything close to them! 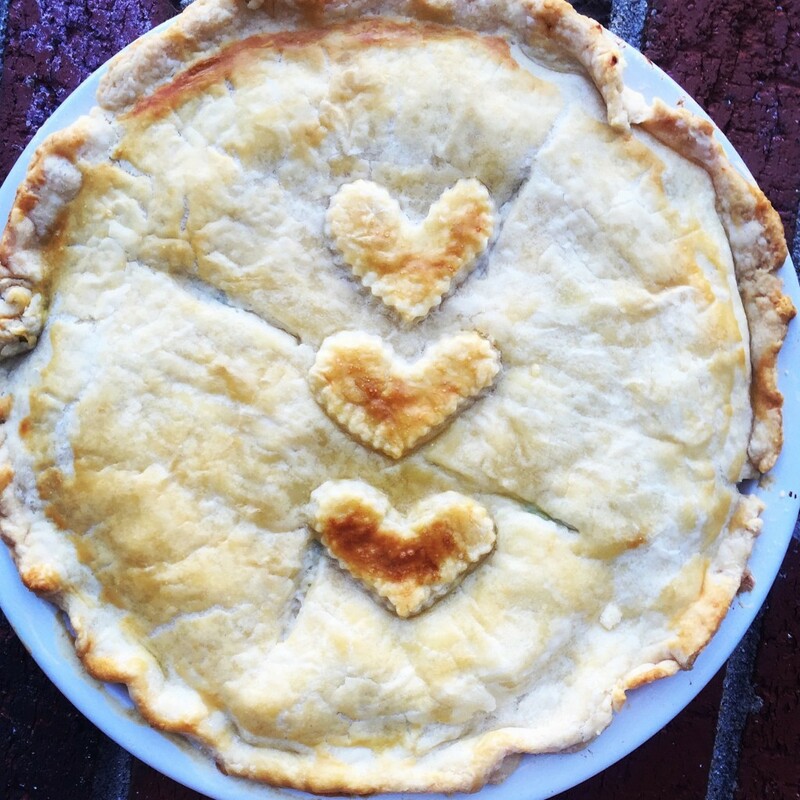 Back to this Leftover Turkey Pot Pie: this is a gentle suggestion of course…. make two. If you are making this to feed 4 one is completely enough but, you will feel so super sad when it’s all gone that maybe you should make TWO. Don’t ask me how come I know this is a good idea either because I will plead the fifth til forever. Also, don’t ask me how I know sometimes you want one all to yourself and you want to eat it from the dish instead of bothering with stupid slices. Leftover Turkey Pot Pie I have once a year and when I do it’s no holds bar. This is in my top 5 of favorite comfort foods and often ends up in me finishing it off with a fork in the pie dish. It’s important to remember that this is a dish you start with love. Sincere love for making others happy with things that taste life-changing good and sending them off with full tummies. The veggie chopping and roux making and homemade crust rolling is such a cathartic process but, also take enough focus that it keeps me from making it as often as I make some other dishes. It’s a process; worthy, for sure… but it remains something I savor less often because if I didn’t it surely wouldn’t be as special. One of the bonus things about this recipe is how much the filling can be customized. I prefer it thicker and not runny but, you can always add extra milk or broth if you prefer a thinner sauce. My version of leftover Turkey Pot Pie is just that MINE. You can completely change it up on your own. It’s an extremely versatile meal and the first time I made it I used what I had in the house. BTW, I am also a huge hater of cooked carrots. Haven’t I mentioned this enough to not have to bother saying it? I feel in general that they are way over-used in recipes so you won’t find them here! The orange color is lovely so I added an orange bell pepper. 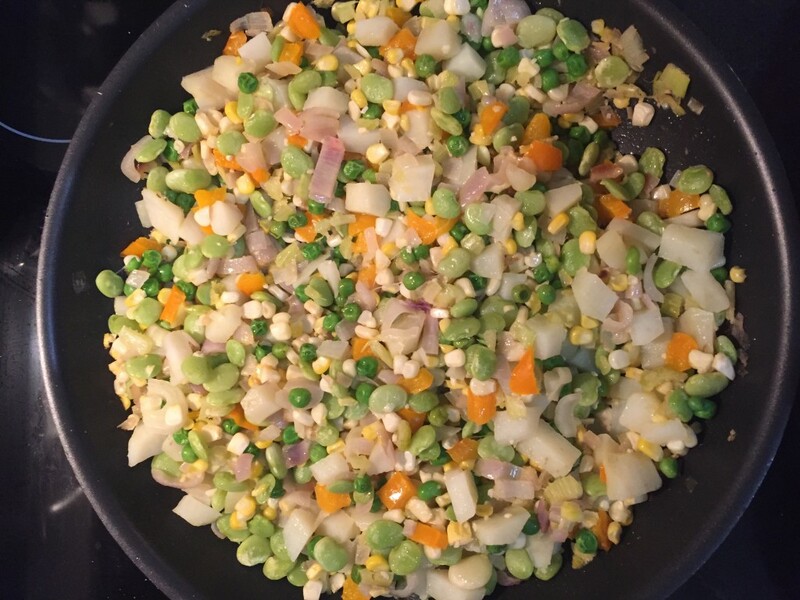 There is also fresh corn, frozen peas & baby Lima beans, celery, onions, and shallots. Feel free to use string beans, carrots or whatever in yours! Chopping an onion is by far my least favorite thing to do in the kitchen friends.I get so frustrated as tears fill my eyes and my eyes burn that I start to ask myself: DO I really Need Onions in this dish?! Yes, Jennifer, always yes because they taste so damn good. Making my Leftover Turkey Pot Pie is worth it because it’s rich, creamy, full of vegetables, and tender turkey. The crust is buttery, flaky, and kind of perfect. Simply put this goodness is worth every single tear and chop and pour and whisk! I promise! I often make two and freeze one so that I can gift it to someone since someone is always having a baby or pull it out for a special visitor. Perhaps I make two though so I can secretly have an extra all for me to enjoy slowly. Just slice it up and freeze in individual pieces! To help save you time on all the steps, please start off by measuring everything & lining it up so you are READY for the cooking. You will thank me later for reminding you how important this is for this recipe.I try to make everything in one large pan. 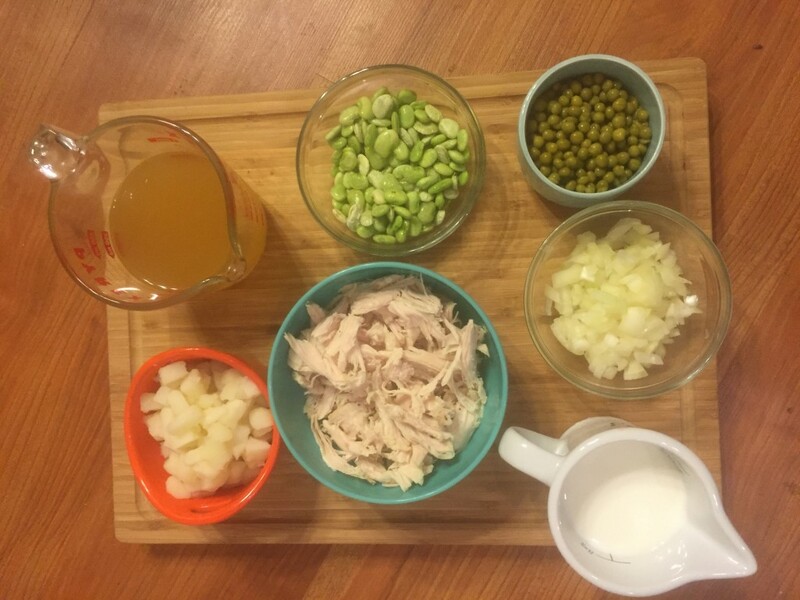 If you are making this with Chicken- Usually, I cook my chicken breast first and then the drippings from that can be my base for cooking the veggies. Sometimes though I boil the chicken the night before so I only have to shred it beforehand. If you choose that route or to just buy a rotisserie chicken then add some olive oil to your pan first. Luckily, your turkey should be all cooked! Before I forget let me share my new FAVORITE pan to prep in! This pan is not only beautiful (crazy about the teal) and roomy but, also affordable! It’s also healthier for you! There are no toxic fumes when overheating, free of all PFOA, PFAS, lead, and cadmium. It’s a ceramic non-stick coated pan and it is perfect for browning butter so you can watch it transition! The picture below will take you straight to Amazon where, Yes I may earn a few pennies but, that doesn’t cost you anything more! In the same pan, having removed the turkey, I make a roux. Butter is melted in a pan over medium heat. Flour is added and whisked together into the butter. It’s a thick and goopy process but, that’s perfectly how it should be! Slowly pour in the chicken broth, whisking away. The flour will ensure that the mixture is thick and luscious but, it’s vital you pay attention. Alternate now with milk.. a little chicken stock at a time, followed by a little milk at a time. Finally, a smidgen of sour cream and your seasonings are added. Once the roux is thick and creamy, I pour it into a bowl. If you haven’t already Shred or chop your turkey at this point and set it aside. Now it’s time to do a nice sauté of your veggies. The vegetables aren’t cooked all the way through. It’s completely good if there’s a bit of a crunch. Once the vegetables are combined with the turkey and sauce, they’re ready to fully cook inside the buttery crust. Also, I use tiny diced potatoes in mine so you will want to boil them for a few while you’re assembling the rest. I’d also suggest leaving out the cold veggies and potatoes until the others are ready to keep them from being mushy. You will add them in the very last couple minutes to heat them some! This is getting good Y’all! 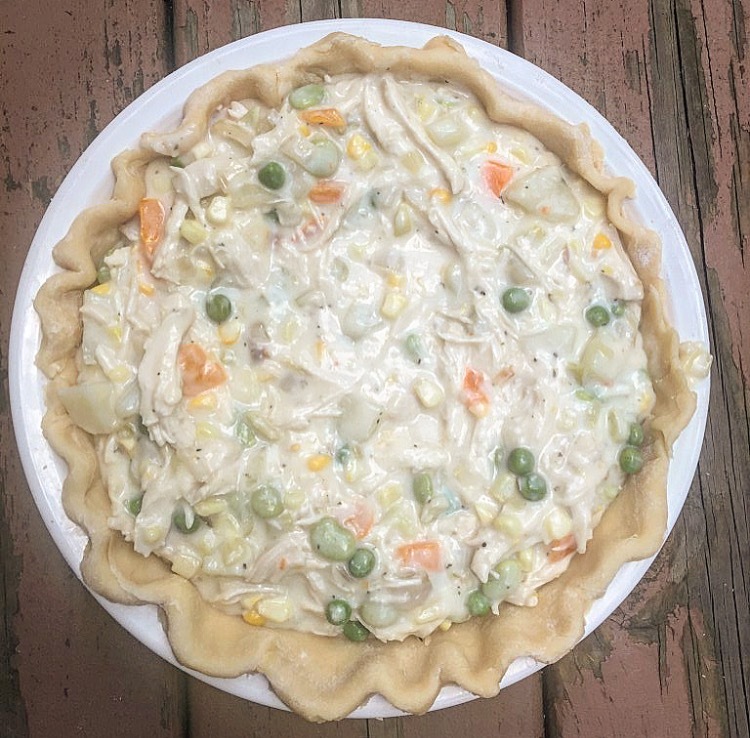 The smell of all this leftover turkey pot pie will make you way excited and almost making you mad that you can’t eat it yet! You should mix all the ingredients together now. You’ll immediately consider eating it right out of the bowl but, hang tight because you’re almost there! Preheat your oven now as you’re in full assembly mode. Roll out your first crust (It should be in the fridge!) You want it to be large enough to overlap your pan but, it can be uneven like mine because it’s the bottom it truly doesn’t matter. You want to be able to still see your butter pats like this photo. If not your crust is too warm and you may want to chill it first. Layer this into your pie pan and leave any overhang as you’ll trim them once you layer the top crust. Or crimp them like I did because you forgot to you were going to add the top crust and thought you were making an open-faced pie! Now, pour in that glorious gift from God filling and stand back and admire the joy you just created. It is really beautiful and so, so good. Then go ahead and roll out your top crust larger so it overlaps. Now you’ll trim each one leaving about an inch overhang and then tuck them in together. This takes your crust to the next level! Holding the bottom and top crust together, fold the two under, tucking it into the pie plate. Think of tucking into someone for bed and know you just put those veggies and chicken into a glorious safe haven. Crimp the edges with your finger or a fork to make it purdy and use any scraps to decorate to your preference! The love you’ll forever have for this pie will probably not be obvious until the first time you make it and you get to make it a 2nd time. It will literally be felt through every step of the process! When you realize how flipping good this leftover turkey pot pie is you will say, it really was worth all this work. I promise! Leftover Turkey Pot Pie requires a good egg wash for the perfect browning. Beat one egg with a fork and brush it on the crust to give it a nice suntan! Bake until the crust is golden and you can see the bubbling of the inside happening; around 30 ish minutes. Now the hard part really comes when it’s done baking. You need to let it sit for an HOUR to cool and thicken just a tad on the inside. It’s like torture and sometimes I only make it 30 minutes. I’m weak. It’s just lovely and if you’re really quiet and close your eyes I bet you’ll even hear angels singing hallelujah when you admire it fresh out of the oven! 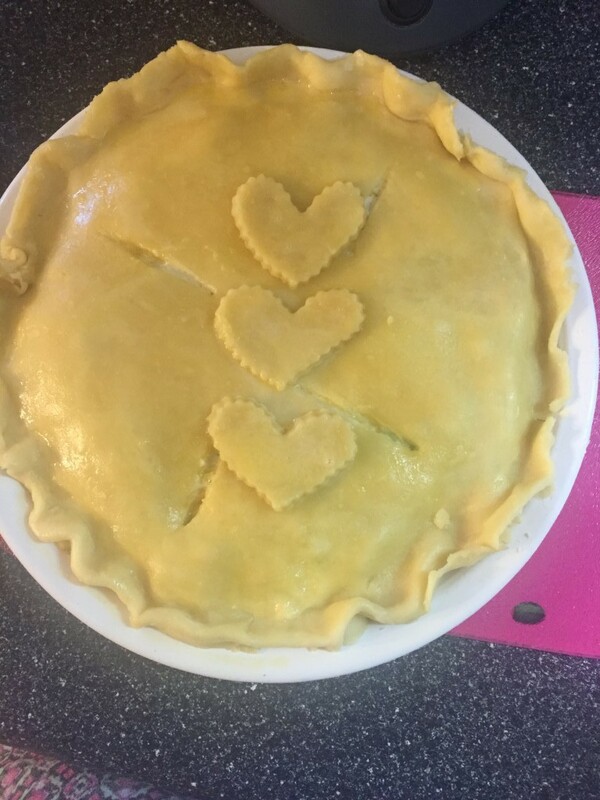 I just love using hearts to make the crust sweet lookin’ and full of love. *this is perfectly wonderful with Chicken also! *don’t be afraid of seasonings because it’s really important to layer all the flavors! Dice the butter into small cubes, or cut it into pats. As long as it holds together easily, without crumbling, it's ready. if it has dry spots, or pieces break off easily, add a bit more water until it's totally cohesive. Gather the dough into a ball, and divide it in half. Gently pat/shape each half into a rough disk. For better texture, chill the dough for at least 30 minutes before rolling. If dough has been refrigerated longer than 30 minutes, allow it to warm at room temperature for 10 to 15 minutes, until it rolls easily. 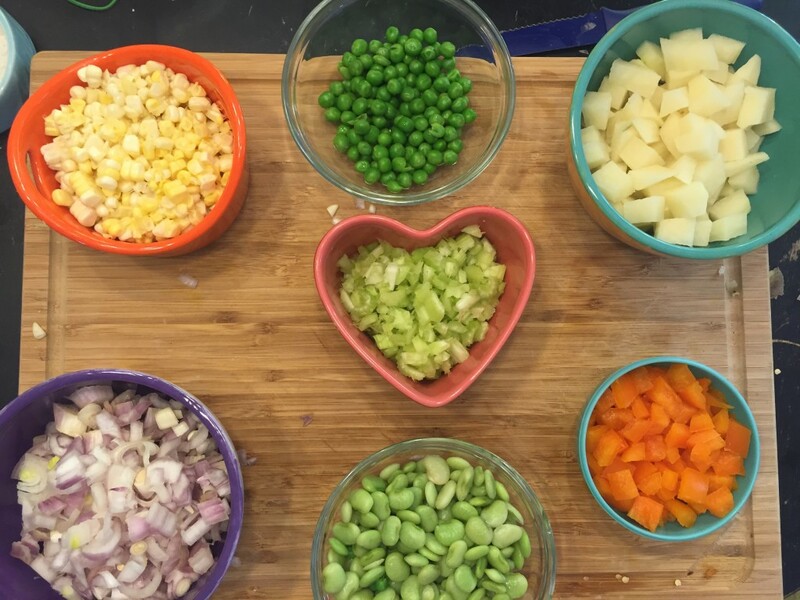 Dice the onion & shallots, garlic, bell pepper, and thawing the frozen baby lima beans & peas and corn. Set aside. Boil your potatoes at the same time and after you drain them.Set Aside. Whisk in the flour. Mixture will be very thick. Heat for 1 minute. Add salt and pepper to taste. (More salt than Remove mixture from heat and spoon into a medium bowl. Set aside.In a large pan over medium heat, melt butter (can sub olive oil) Add onions and shallots and saute until translucent, about 3 minutes. Add minced garlic and saute for one minute more. Now throw in your baby limas, peas, corn, & potatoes. Cook for about 5 minutes. The vegetables will not be entirely cooked through. That’s ok! Remove from heat and stir in cooked, shredded turkey Stir the mixture to the sauce. Stir to combine. Set aside and allow the filling to cool slightly. 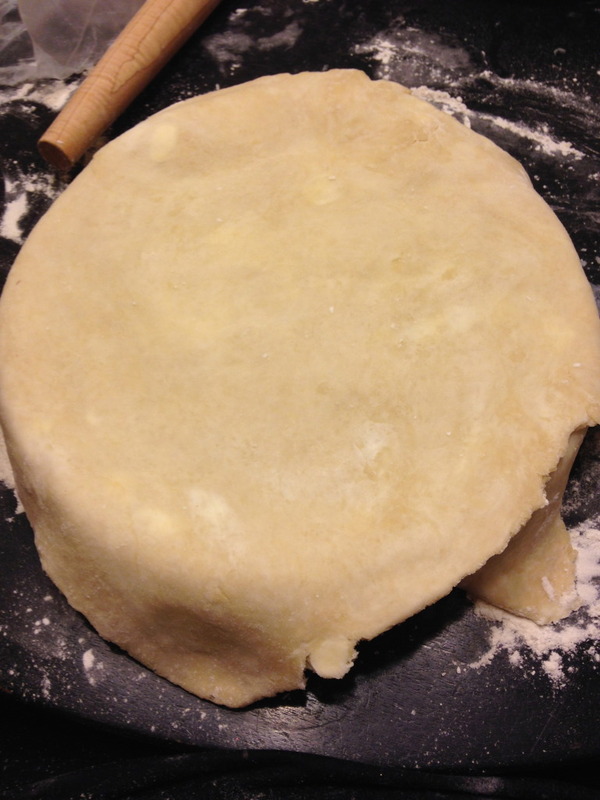 To assemble the pie, remove one of the pie dough disks from the fridge. On a lightly floured surface, roll dough out into about a 13-inch round. 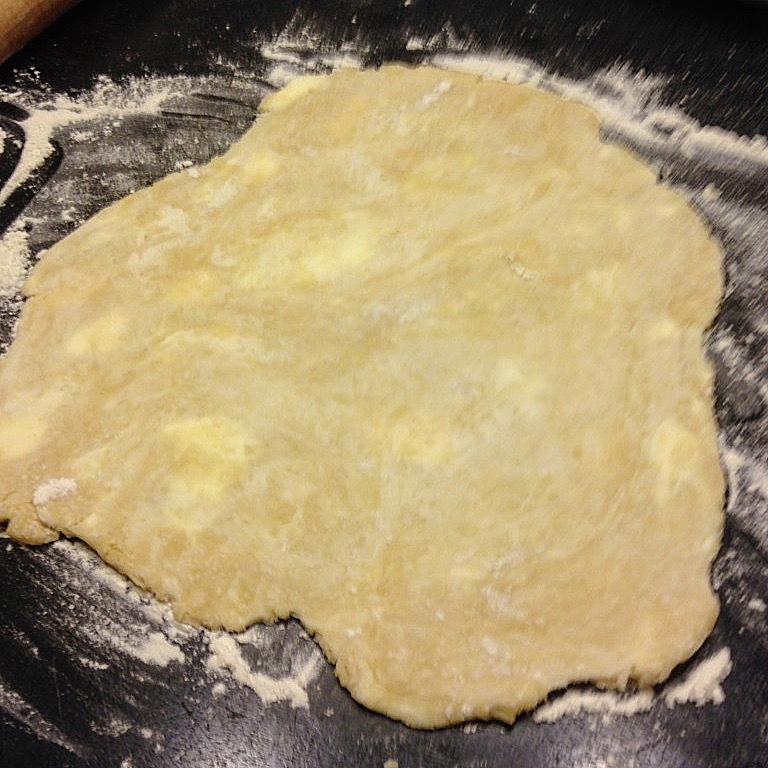 Roll the dough a few strokes, then use your fingers to move the emerging circle around the floured surface. This ensures that the dough isn’t sticking to the work surface. The circle won’t be perfect, that’s ok. Try not to get any tears in the rolled out dough, but if you do, they can be patched together with extra dough. When you roll the dough and you can see it start springing back, that means that the butter is warming and the crust shouldn’t be rolled out anymore. Gently lift the 13-inch round from the floured surface and center in a deep 9-inch round pie dish. Place in the fridge while you roll out the top crust. Spoon the filling into the bottom pie crust. Carefully remove the top crust from the work surface and drape over the filling in the pie dish. With a small knife, trim the crust, leaving about 1-inch overhang. With your fingers press the top and bottom crusts together and fold under. Use a fork or your fingers to crimp the edges of the dough. Cut five small slits in the top of the crust so the steam can vent. Brush lightly with beaten egg and place in the fridge to chill while the oven preheats. Place a rack in the center of the oven and preheat oven to 400 degrees F.
Place pie in the oven bake for 10 minutes. Reduce the oven heat to 375 and bake for 10 to 15 more minutes, or until the crust is golden brown. Remove from the oven and allow to cool for 1 hours before serving. Place covered in the fridge to store. Pie lasts up to 3 or 4 days. 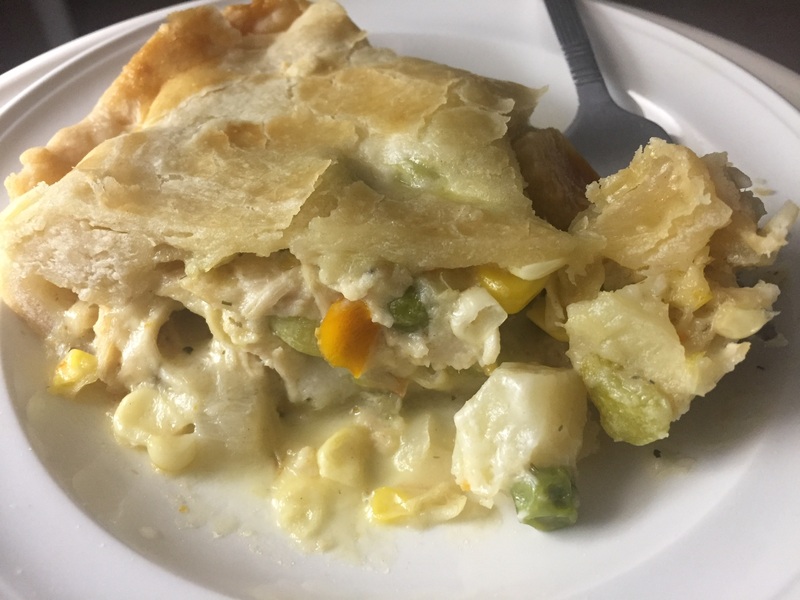 This entry was posted in Baking, comfort food and tagged #blog, #budget, #butter, #Christmas, #comfortfood, #cozy, #crust, #december, #feedfeed, #goodness, #jenniferbakes, #jkbakingcompany, #kaf, #kingarthurflour, #leftovers, #leftoverturkey, #leftoverturkeypotpie, #love, #meals, #November, #pie, #piecrust, #potpie, #thankful, #thanksgiving, #thatsdarling, #thebakefeed, #thefeedfeed, #turkey, #vscofood, #yum. This looks amazing!!!! So smart too. I am defintely trying! Thank you so much, Emilee! You will not be disappointed! Angie, I love hearts too! They are dear to me! We’re hosting this year and I know we’re going to have pounds of turkey left, so we will definitely be doing this! I love how many veggies you packed in here! oh, Yay for hosting! I love it because I am such a lover of staying up cooking and seeing everyone’s faces enjoy their plates of food. The crust is the only thing I think that makes this unhealthy. :) Thanks so much, Heather! The ingredient list does not include green beans, but they are mentioned in the instructions. What amount do you suggest? Thanks. This sounds YUMMY. Hey Judi! Thanks for catching that because my original recipe I used green beans but, when I finalized it I left them out just because I didn’t have them that day! I have corrected it. You could add about 1/3 cup and they’d be great! I hope you try it soon! Yum!! This looks awesome!! I love the step by step instructions too. Now I know what to do with all the leftover turkey this year. Thanks!! Yes! It will become a new tradition, Tiffany! Thanks! 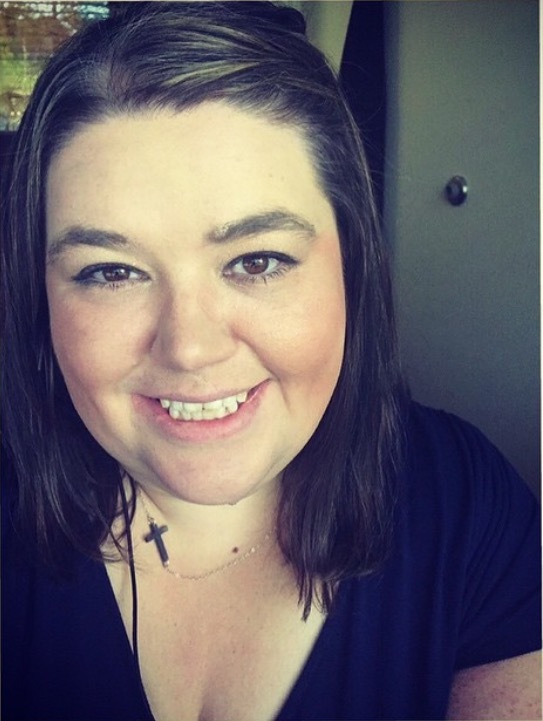 So, I just have to share this little story with you! 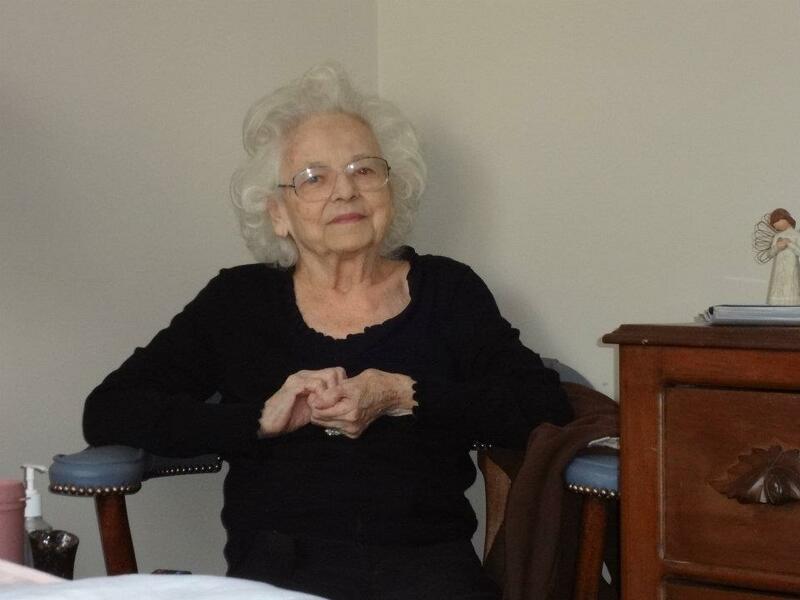 In the first few months of our marriage, I very quickly learned that my cooking was less than my mother-in-law’s! (It’s funny now, but ya’ll? It was not funny then!) Anyhow, in an attempt to impress my hubby, and the friend coming over for dinner, I made my very first Turkey Pie. I worked so hard at that pie! I followed the directions to a T! I rolled and rolled and rolled that pie crust I made from scratch, assembled all the cut up vegetables and spices and stuff in a bowl, dumped the mixture in the crust, fitted the top rolled and rolled and rolled crust on top, and squished the ends together. I gingerly made slits in the top of the crust and proudly popped that pie into the oven! I went about the clean up and after washing up the pots and bowls, I noticed one bowl set off to the side. I grabbed it to wash, and promptly discovered it was filled with chopped turkey. You guys? I actually forgot to put the turkey into my Turkey Pot Pie! This might actually be one of my favorite memories! I laughed out loud reading this! That is SO funny and absolutely a precious memory! Thank you so much for sharing and stopping by! This looks delicious! I will have to keep this handy to try it out this year! Thank you, Emily! I hope you do and let me know! this is an awesome idea for left over turkey on thanks giving! they’re very husband friendly, Susan! Jennifer- this looks so good! What a great way to use your turkey leftovers! Those little hearts look beautiful as well! I love a pot pie! Happy Thanksgiving! I worked in a professional kitchen in my previous life. You have a very detailed recipe here sprinkled with humor in the writing. Great job. I love turkey pot pie. We usually got a turkey from our workplace for thanksgiving. Because I was too lazy to cook a turkey whole, usually I de-boned it and used the bones to make stock and the meat for something like this pot pie. Mmm pie!! The best pies are homemade pies as well, this looks like a great one but we don’t often eat turkey here in New Zealand. Can you use chicken instead? 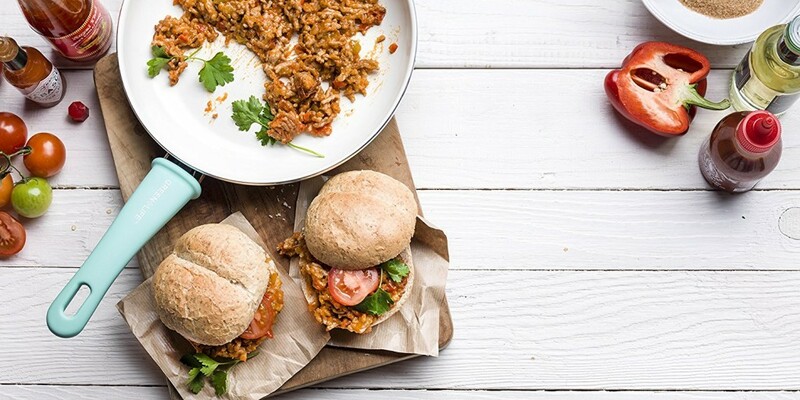 This looks absolutely amazing, wish I had leftovers to make this with!